Each year when I see the turkey “Grand Slams” on TV, I pine for the experience, but I am a small game hunter to the bone. Being an optimist I figured I could create my own slam, right? On that note I figured that since I hunted rabbits a lot I had a good starting point. So this year I set out to get a Rabbit Grand Slam, I was going to hunt all four legal rabbit/hare species in Idaho – black-tailed jackrabbits, white-tailed jackrabbits, Cottontail rabbits and snowshoe hares. I managed ¾, not bad for a first attempt!To be clear, rabbits are not hares and hares are not rabbits but all belong to the Leporidae family. Hare meat, like the black tailed Jackrabbit and the white-tailed jackrabbit, is darker and much more flavorful than the chicken-y cotton tail rabbit meat. Snowshoes are hares as well, but often are less red and closer to the rabbit than hare. Normally the meat is ranked, at least in my family, 1. cottontail rabbit, 2. snowshoe hare, 3. white-tailed jackrabbit, 3. black-tailed jackrabbit. Mind you this is not scientific but in terms of edibility it kind of makes sense. Cottontails due the least amount of running, eat green veggies, and are a white meat species. They are almost bound to taste better. Snowshoes eat softer grasses and also tend to run very little, making the meat all the more tender. White-tailed and black-tailed jacks are a near tie on eating; I think my family enjoys white-tailed jacks more simply because of the novelty. Both black and white tend to eat sage brush and hard barks, not a culinary friendly diet. Each of these species has its own habitat making an attempt at a grand slam all the more fun. Snowshoes are located in northern pine forests and often lurk in the darkest and thickest brush possible. I actually shot mine this year because it looked like snow had fallen inside a stump, but the cover was too thick for snow to reach that location. He stood out well on the brown undercover, his pure white body a beacon to me. On snow I would have never seen him. Black-tailed jackrabbits are more the classic sagebrush dwellers. With just a little cover, a little water and plenty of open spaces jackrabbits can thrive. I often hunt them on the BLM private property boundaries near fields. They like the extra food and the fence lines often provide a good shooting lane. White-tailed jackrabbits are a lot more elusive often being forced to high altitude ranges, by the more aggressive black-tailed jackrabbits, with sage brush. Most often I only see them in the headlights of my truck on my way mule deer hunting. These hares can get quite large and their dirty white coat in the winter had me convinced that I had discovered an isolated population of snowshoe hares one year. I was wrong. Cottontails are my nostalgia rabbit. I’ve hunted them since I can remember, mostly at the brahma bull ranch I grew up next to. We were not allowed guns on the ranch when I was kids so we had to use wrist rockets and our bows. They lived under farm equipment, in the blackberry patches, the trash pile and in the old ditch slag. It was quite a feat to come home with a rabbit that you killed with a rock and rubber band, I’ll never forget it. I did not shoot a cottontail rabbit this past fall, much to my dismay. This fall I actively hunted rabbits, making special trips in search for each. I found it an inexpensive way to add a little game to my hunting, add some tension and uncertainty. For a bonus I would routinely run into quail, chukar, huns and grouse. It was terrible and SUCH a burden to have to hunt those while after my rabbits. Next year I will be challenging myself to a Rabbit Grand Slam again, if for nothing else than to see some cool country and eat some amazing animals. If you decide to do the Rabbit Grand Slam in your area your will certainly need a recipe or two. It never hurts to have a classic recipe at the ready. The classics are classic for a reason – they are typically awesome. Caesar Salad, Fettuccini Alfredo, Kentucky BBQ Ribs, Stairway to Heaven – all classics and all are wonderful. In the culinary world some wild game dishes have “classic” status associated with them. One clear example is Lapin a la Moutarde – or Rabbit with Mustard sauce. The quick and easy of the recipe is to simmer rabbit until tender in white wine, then add cream, mustard and herbs. The combination is heavenly. But, as hunters, we are not often blessed with the most tender rabbit right out of a fancy French market. More often than not, at least for me, I don’t even shoot rabbits. Most often I shoot hares, a completely different species. To use a hare for a classic rabbit dish is close to heresy BUT we can do this, together. First things first you must brine a hare for this type of cooking. Unless you stick a jackrabbit in a crock pot for 4-6 hours you are not going to get moist and tender meat. That said you can brine hare meat and fool everyone in 2 hours. Brining artificially overhydrates meat thus making it moist when cooked/overcooked. Second thing – you must debone the hare leg. 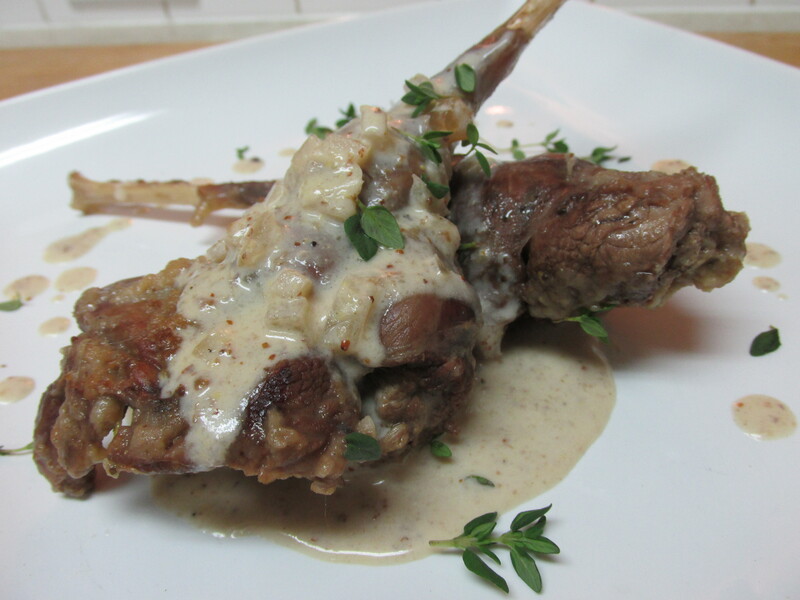 In the classic rabbit dish the thigh bone is left in. if this is done with a hare, it takes longer to cook. So, debone the leg, stuff it with thyme and mustard and tie it closed. It works great, see the pictures attached. A brine is a salty water mix that adds flavor and moisture to meat. For hares, specifically my frequent query the black tailed jackrabbit, I brine for at least 24 hours. Stir all ingredients into the hot water. Make sure the water is as hot as your faucet can produce, or maybe even boil the water. Let brine cool to room temp. Add cut up rabbit to brine and place all in the refrigerator, making sure to cover all the meat with brine. Let set for 24 hours. See here for directions on how to properly cut up a rabbit/hare. The big back legs of a wild hare are daunting. They are a working muscle and are NOT tender cuts of meat. So, what does a hunter do with them? After removing them from the body flip them so that the inside of the thigh is facing up. You will notice a line that follows the leg bone. Starting at the ball joint cut along this line until you reach the “knee” joint. Then work the tip of the knife under the leg bone working it free of the thigh. When the done is removed from inside the thigh it will still be connected to the knee joint. At this point I use blunt force and twist the bone until I hear a crack of cartilage, then I will cut the connective ligaments and tendons and pull off the inside thigh bone. Spread open the leg meat and place one sprig of thyme in each leg. Then spread half the mustard in each leg. Tie each leg closed. Legs are now ready for the recipe. Pat the brined rabbit dry with paper towels. Season them with salt and pepper. Roll the cuts in the flour and reserve on a dry plate. In a medium sauté pan with a lid heat ½ the butter or oil. When hot, but not yet browning, add two or three of the rabbit or hare sections to brown. Cook on each side 2-3 minutes until a golden crust has formed, flip. When browned on both sides remove back to plate. Add remaining oil and brown the remaining rabbit sections. When all the rabbit is brown add the onion to the pan. Let cook for 3 minutes then add all the rabbit/hare sections back to the pan and pour in the cup of white wine. Lower heat to a simmer and cover pan with a tight fitting lid. Let simmer for one hour, check the moisture level every 10 minutes or so and add more water if needed. After one hour check meat to see if it is fall off the bone tender. If the rabbit or hare is more than a year old, it will probably take more time. Continue to add water and check tenderness until the meat is sufficiently tender. This should take no more than two hours. When the meat is tender, remove it to a clean dry plate. Turn heat up to medium high and boil the remaining wine mix. Add the cream, mustard and thyme. Reduce heat to a simmer and reduce the mixture to a gravy consistency. This should only take 3-4 minutes. Taste the sauce, adjust seasoning with salt and pepper as needed. When the sauce tastes good add the rabbit legs back to the pan, turn off the heat and cover with the lid. Let sit for 3 minutes. Remove legs to a platter and pour sauce over the top, garnish with fresh thyme sprigs. You are very easy to read and quite enjoyable. My family lives in eastern NM and we have a LOT of rabbits! I’m excited to try this recipe tomorrow.